First of all, I must thank Pradeep for getting me these pens from Rajahmundry. I actually got lot of pens from Ratnam, Ratnamson, and Guider who all are stationed at Rajahmundry in Andhra Pradesh state of India. 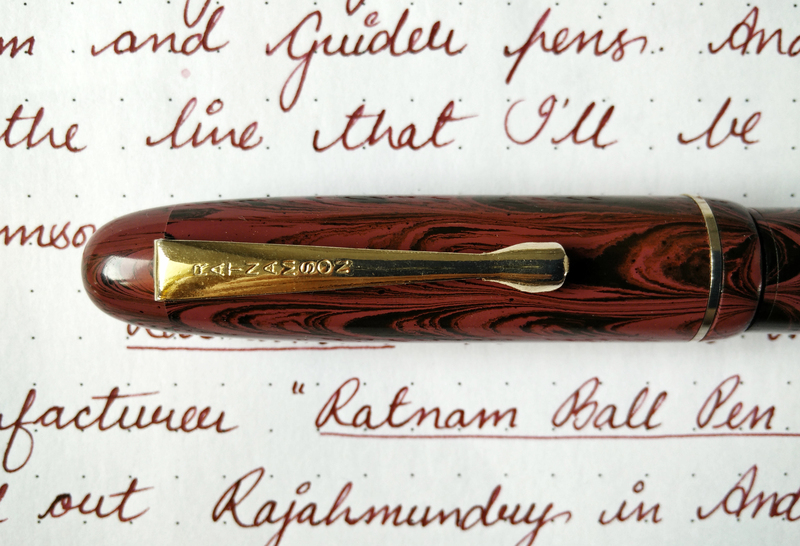 So this, as in Ratnamson 302, is the first in line to be reviewed and this pen is one of the fast selling models of Ratnamson. Ratnamson is a brand name of Ratnam Ball pen works. There is other brand by the name of Ratnam which is owned by Ratnam Pen Works. As far as I know Ratnam Pen works is an original parent company which got split into two and thus Ratnamson came into existence. And both the companies produce some good quality pens. which i will be reviewing it here one by one. 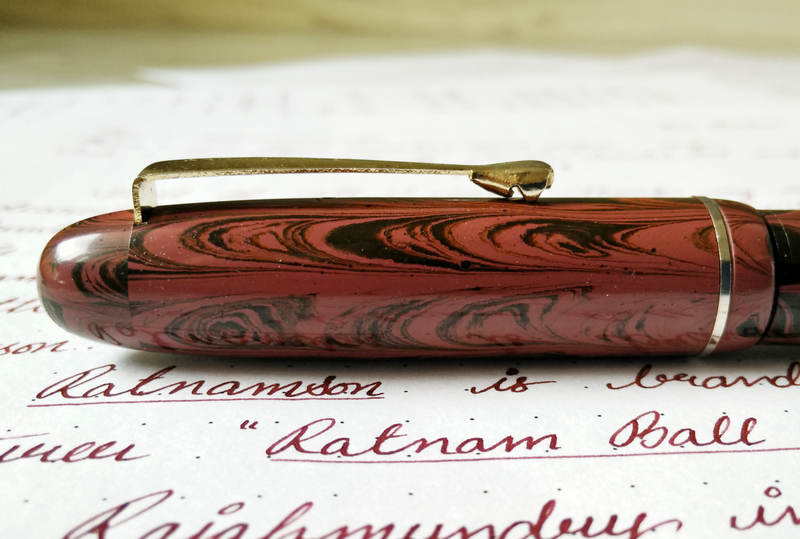 Like I said earlier this pen is one of the fast selling model of Ratnamson’s and it is a very well designed and executed pen. 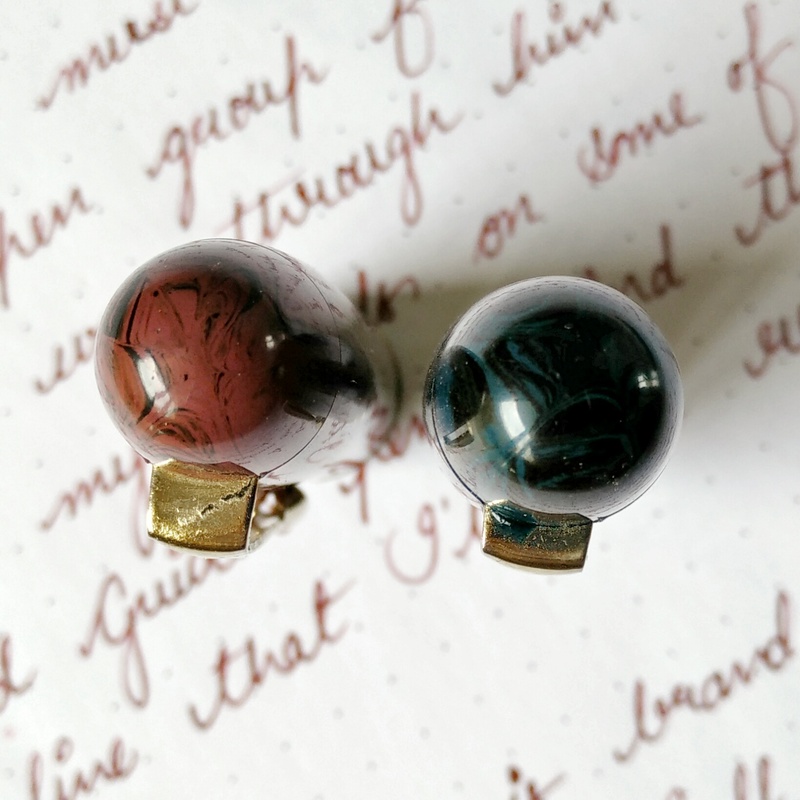 Made of Ebonite this pen come in various regular ebonite colors like Rose Pink Ripple, Blue Ripple (Both shown in pic above), Black, Brown Ripple, Green Ripple and Dark Brown Ripple. Also mottled pattern is available but i believe that is on request. 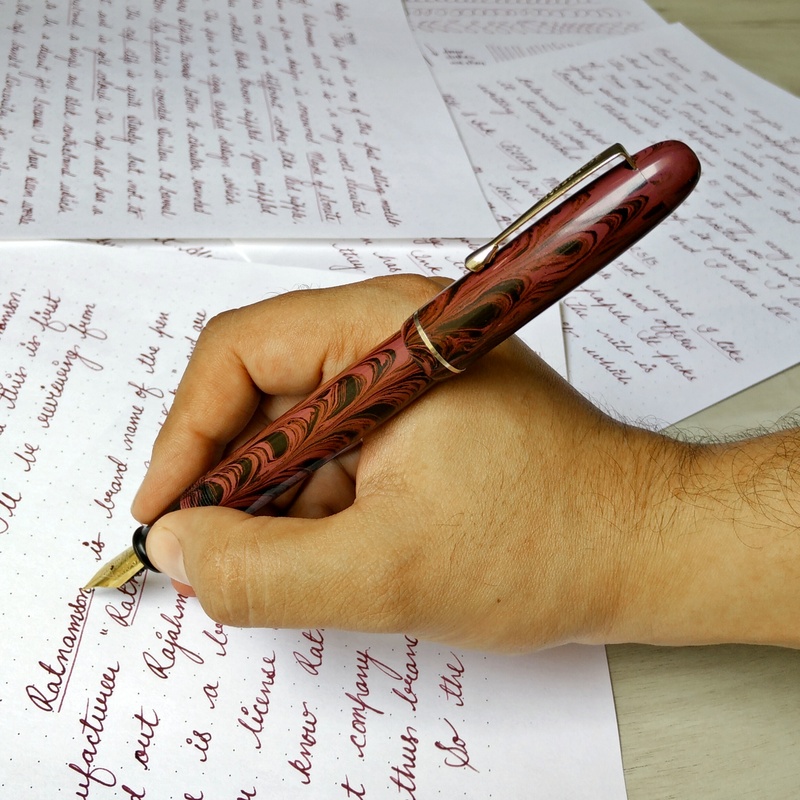 The pen is cigar shaped design which tapers slightly just a bit towards the end to circular rounded bottom. The cap finial is also rounded similar to the barrel end. The grip section is made of black color ebonite and their is a slight tapering towards the top of section from middle of barrel. The length of grip section is not that long. Actually it is short. But thats not a problem. Circular thread patterns do provide for grip and threads are not at all sharp. 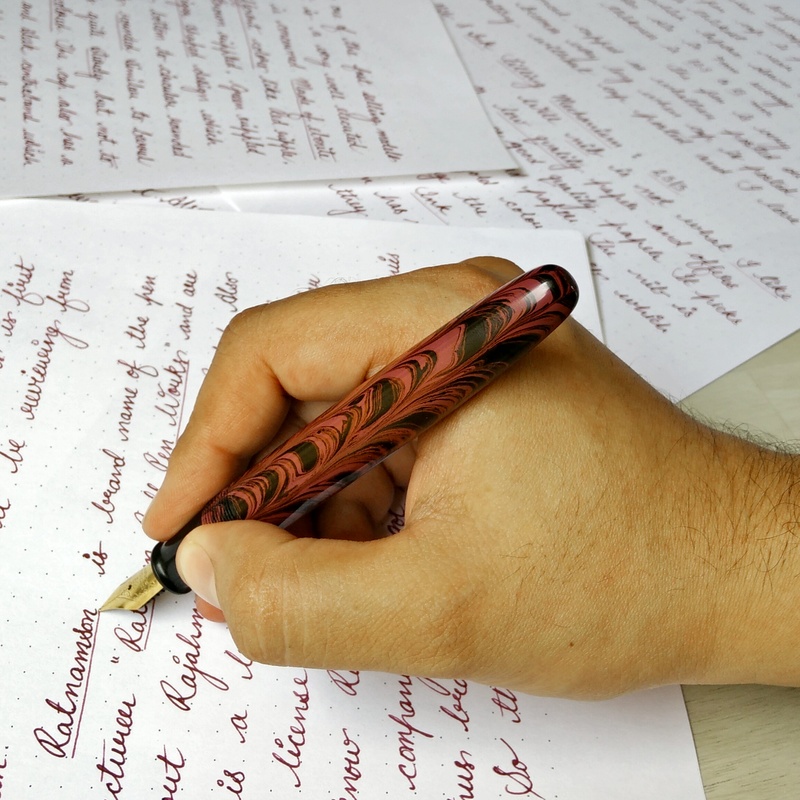 The picture below shows the rounded bottom and top of the pen. The cap clip though is quite sturdy but I can see there is bit of uniformity in insertion of clip inside the cap, which is because of the reason these are all hand made. You can see from the image above the difference of clip insert inside the cap. Nevertheless these are minor things and can be resolved easily. The cap has slim center band which seems to be a okay kind of job because i have seen many manufacturers not able to take care of bands properly. 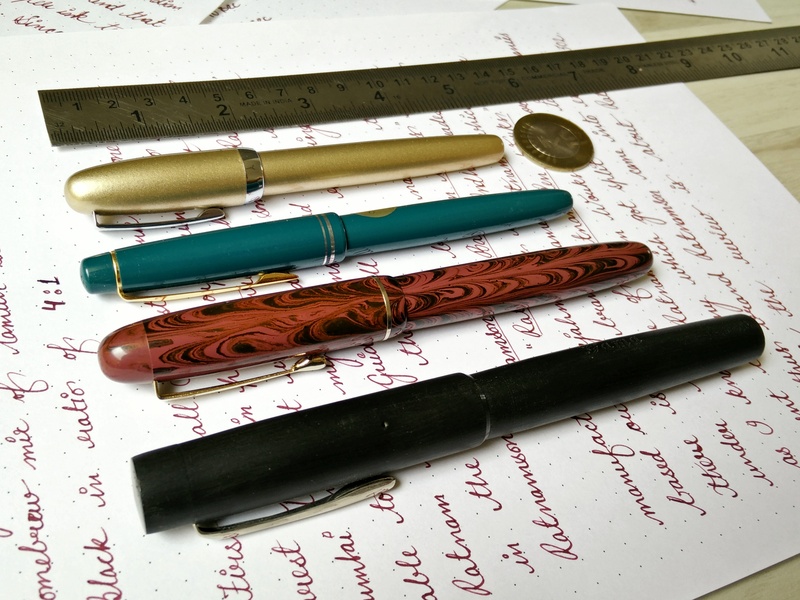 I love the pens with centre band. 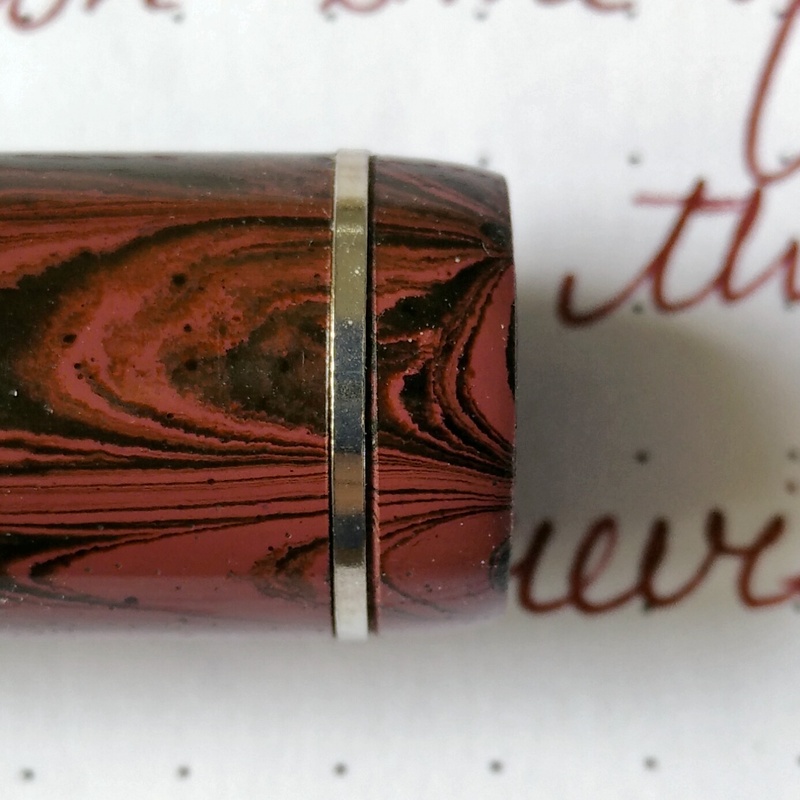 Though I am not happy with the centre band on the cap but the pen shape and finish is far above what i expected. 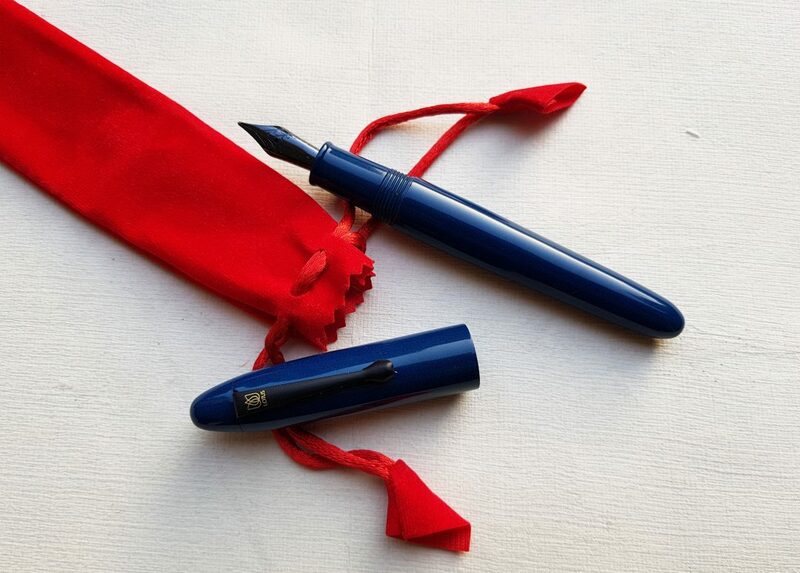 Like most of the Indian pens this also comes with breather hole which helps in tackling the vacuum created while opening the pen and thus preventing ink leakage. 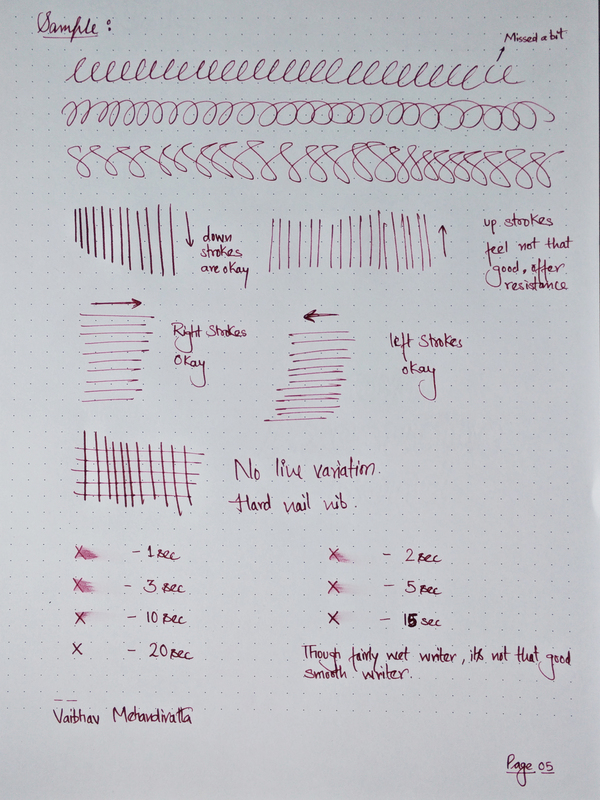 Below are the few images showing the pen comparison. 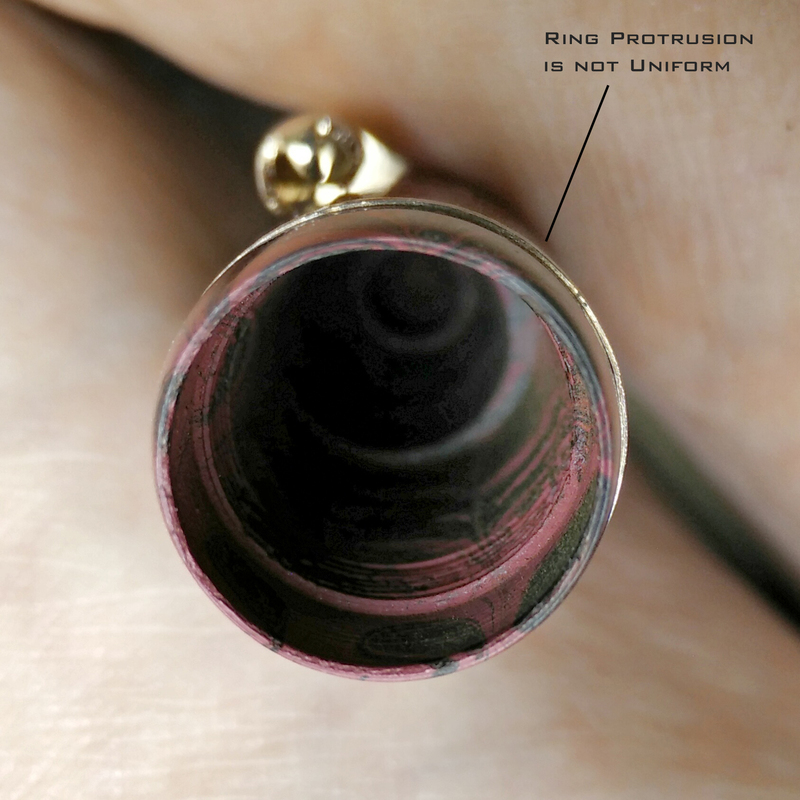 The pen built quality barring just two areas with regards to centre band and clip insertion inside cap, is amazing. The material used is amazing. 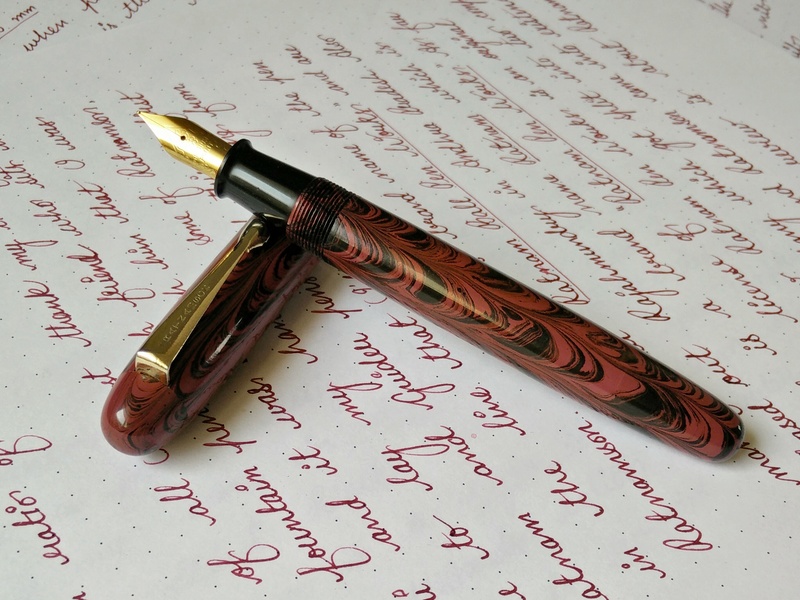 Handmade and overall well executed classic designed pen. Lastly one thing i wanted to mention is that cap threads are not that smooth as it should be and offer certain resistance while opening. 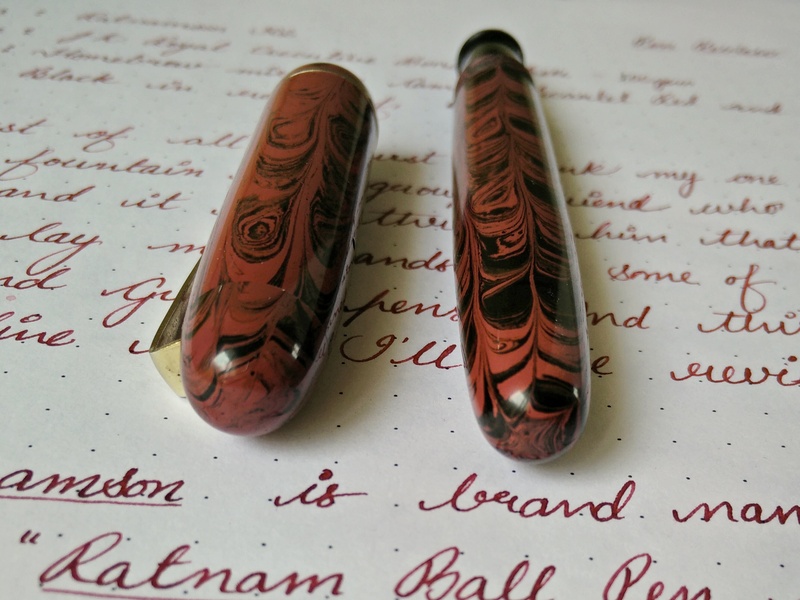 One good thing with the ebonite pens is that they are extremely well balanced weather cap is posted or not. 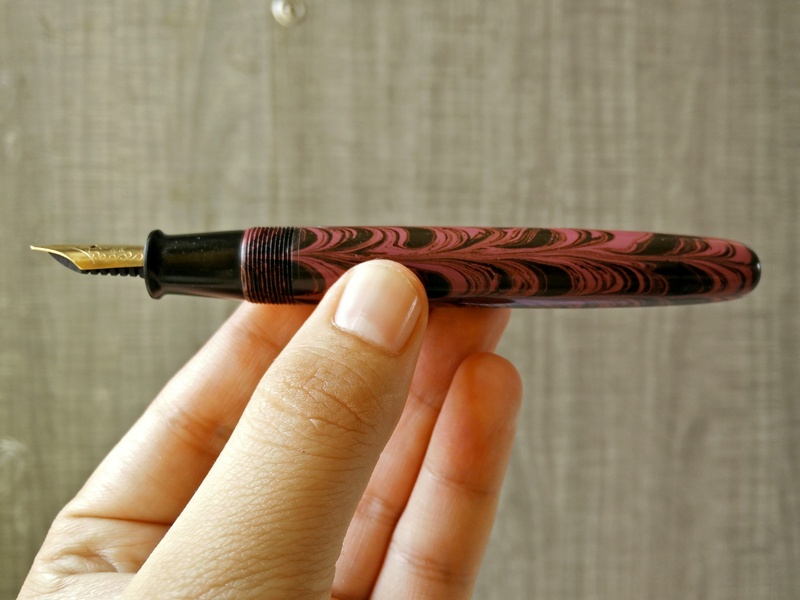 The length of the pen is 145 mm when capped and 125 mm when uncapped including the nib. And when cap is posted it is approx 165 mm long. The cap is thickest near centre band at 14mm dia and the average barrel thickness is 13 mm and grip section thickness is 9 to 10 mm. 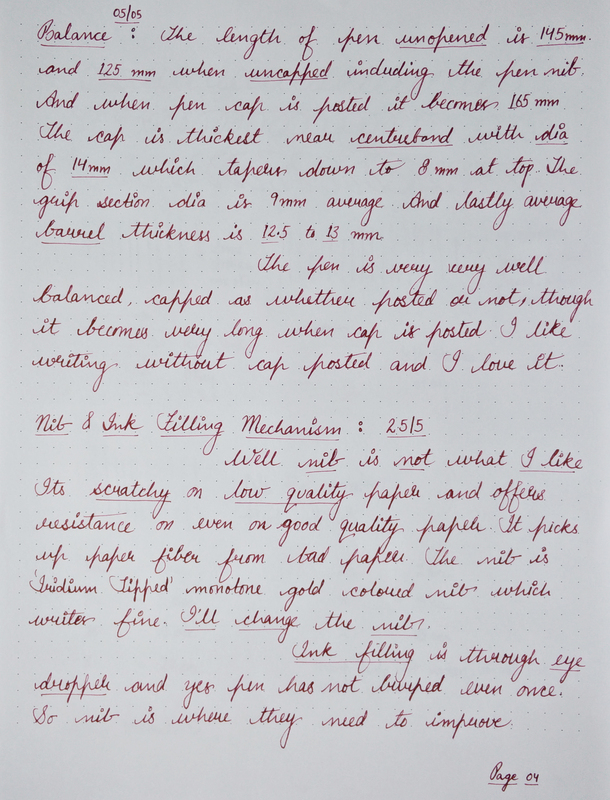 The pen is very well balanced with cap posted or not posted, though it becomes very long id the cap is posted. 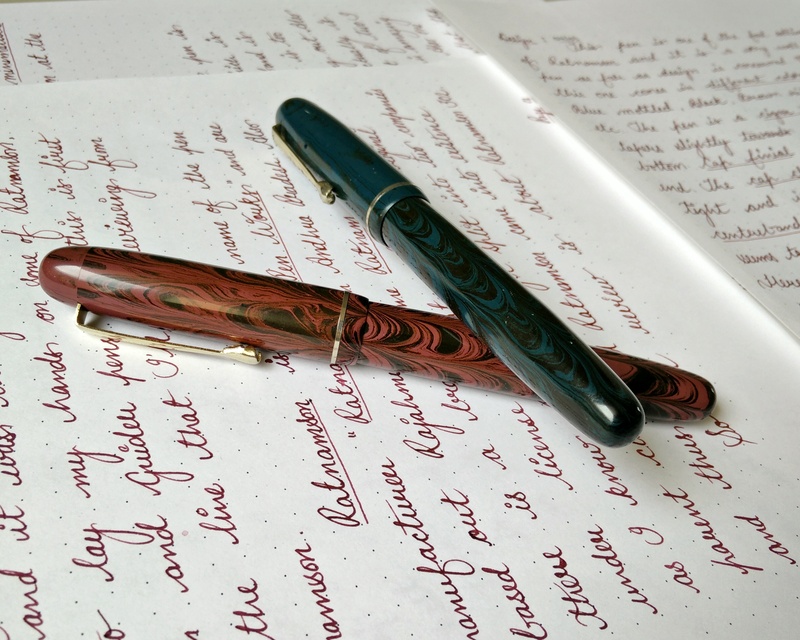 I personally prefer writing without posting cap. Well this is one area where i was not that much happy. 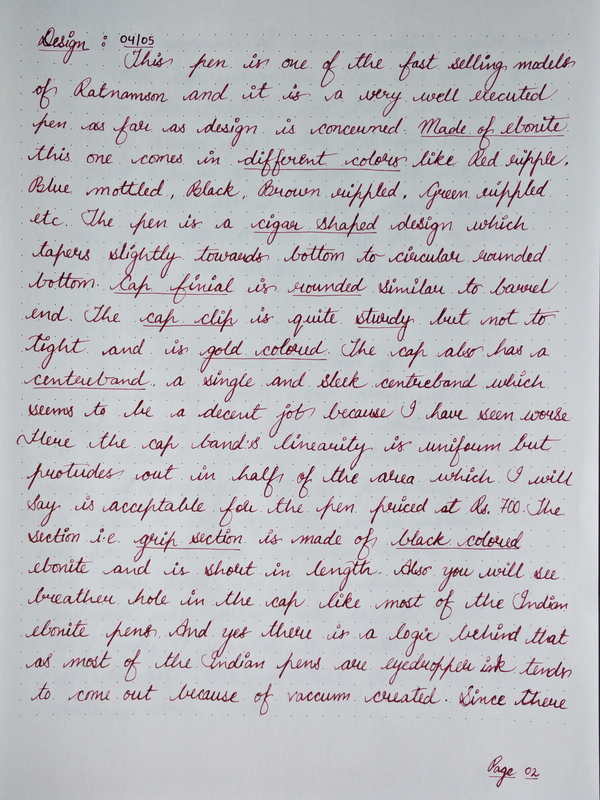 It gives you resistance on good quality paper (which in a way is good for handwriting) but writes scratchy on not so good quality paper and picks up paper fiber even. 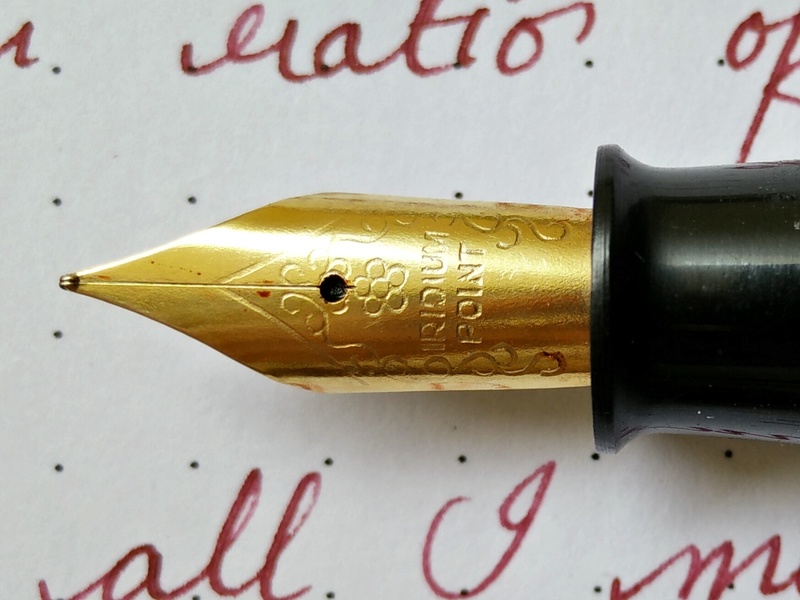 The nib is gold color monotone iridium tipped nib and it writes fine. 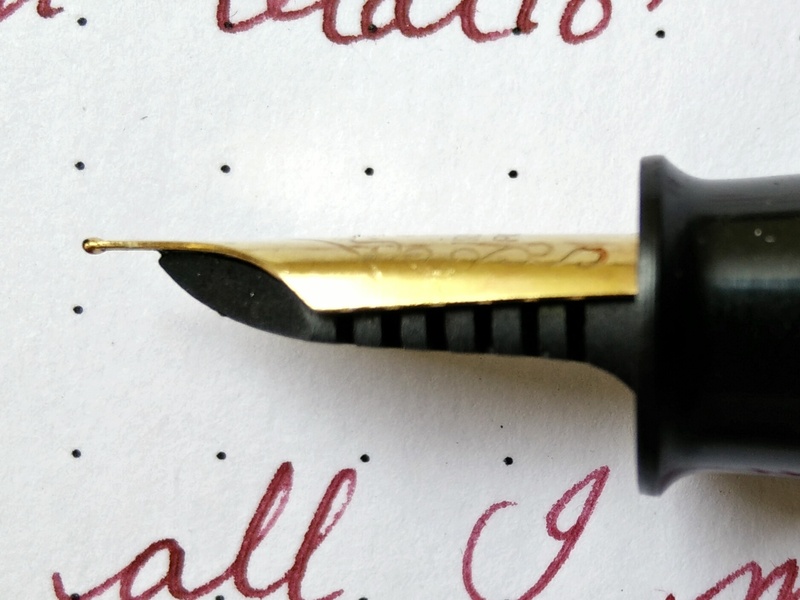 I actually will end up changing the nib. 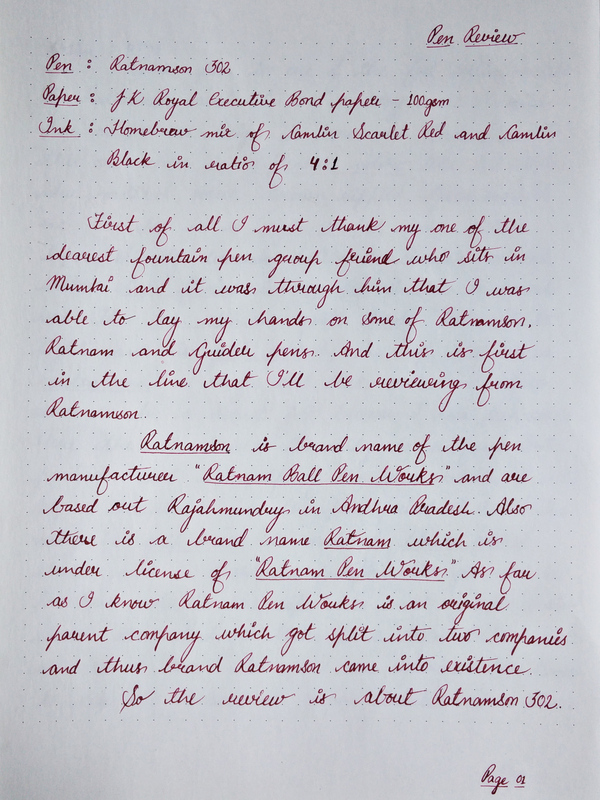 The feed is made of ebonite and the pen writes actually bit wet. 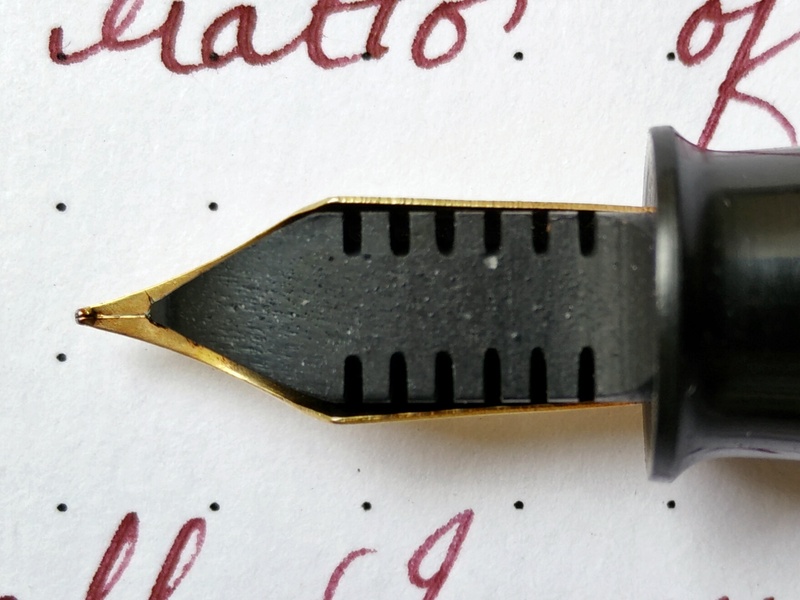 I had to do certain smoothing on the nib. And still I am not happy. 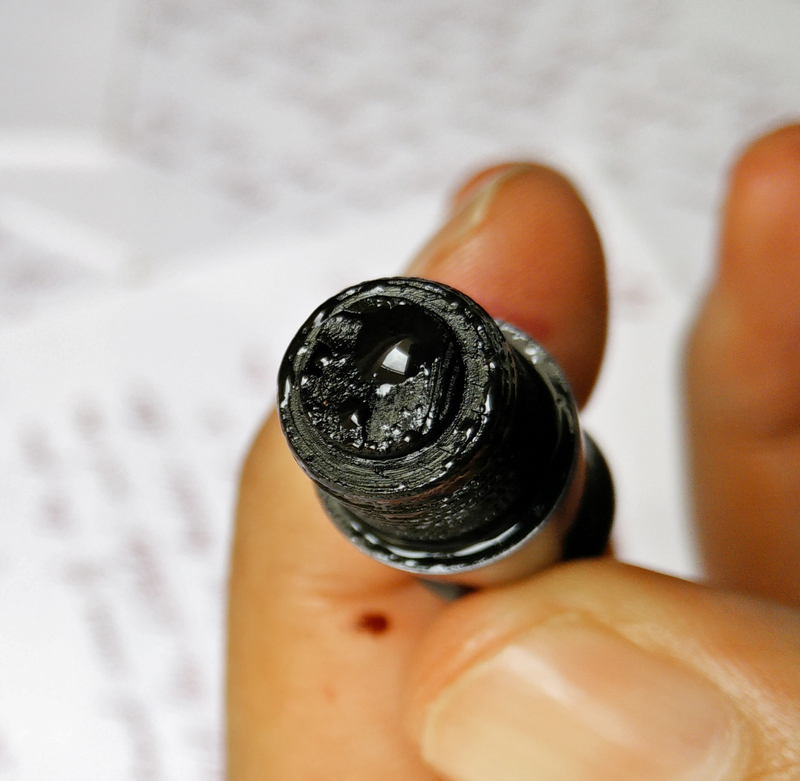 The ink filling mechanism is through eyedropper and it holds good amount of ink. 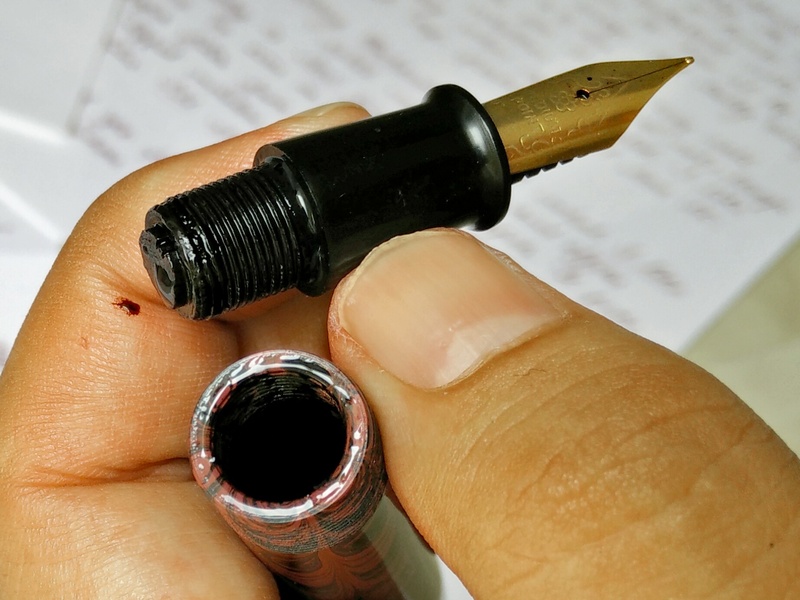 Good thing about the pen is that it never burped on me while writing for a complete week. 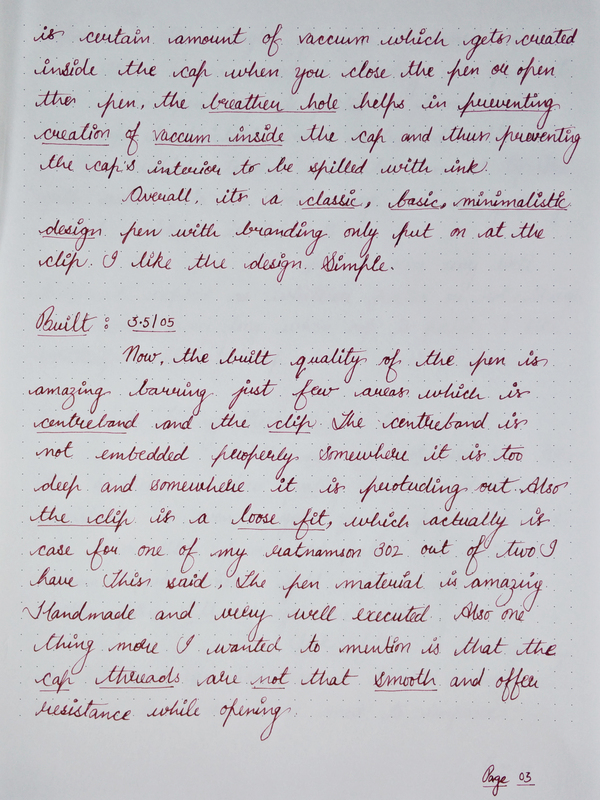 Below are the few images of my handwritten review which shows sample and ink dry test for your reference. 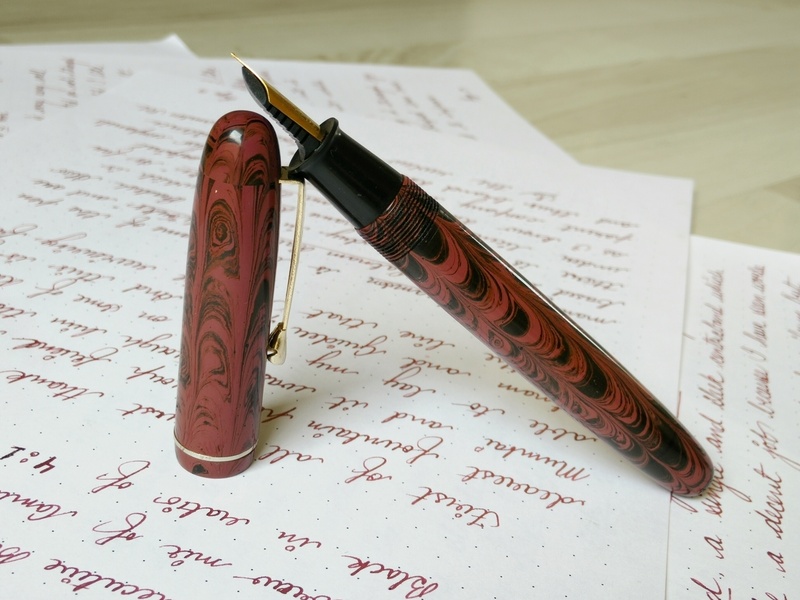 I will buy this pen for its design and change its nib. 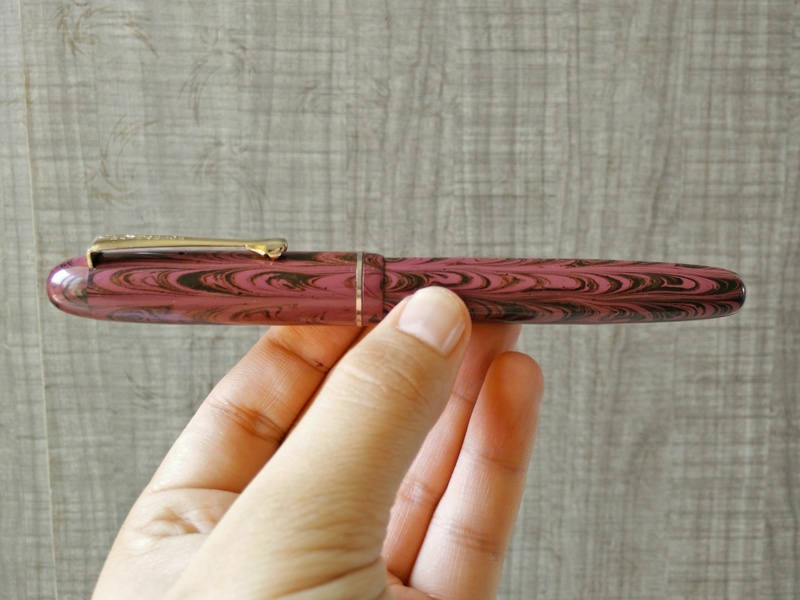 This pen is not that expensive and retails around for 12 to 15 USD. And thats why i will buy this pen for its classic design and long history behind brand name. 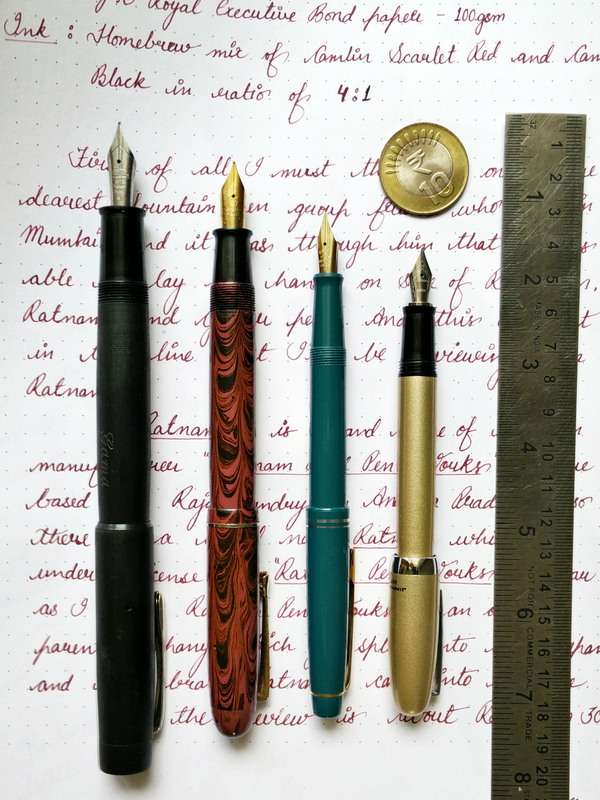 Which nib you used to replace the one that comes with it. 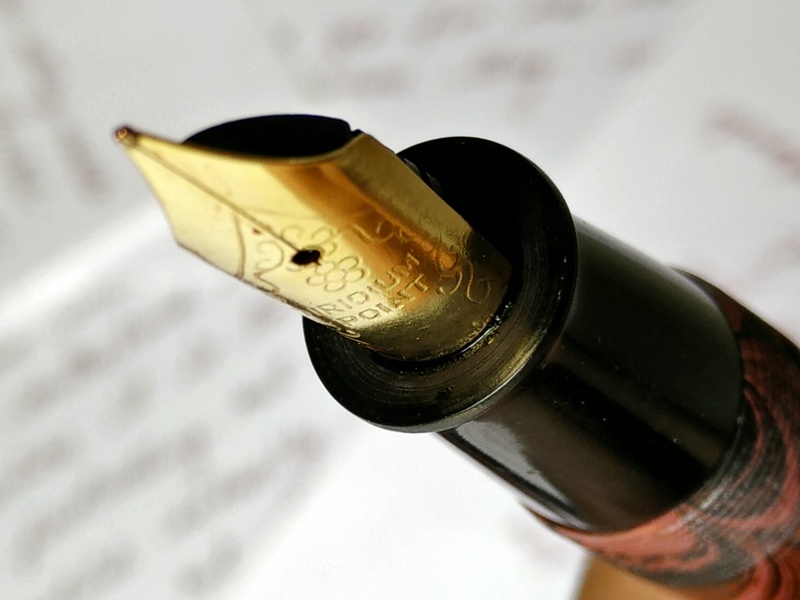 Guider and most pen manufacturers in India use fine nibs which are sometimes Sctratchy. 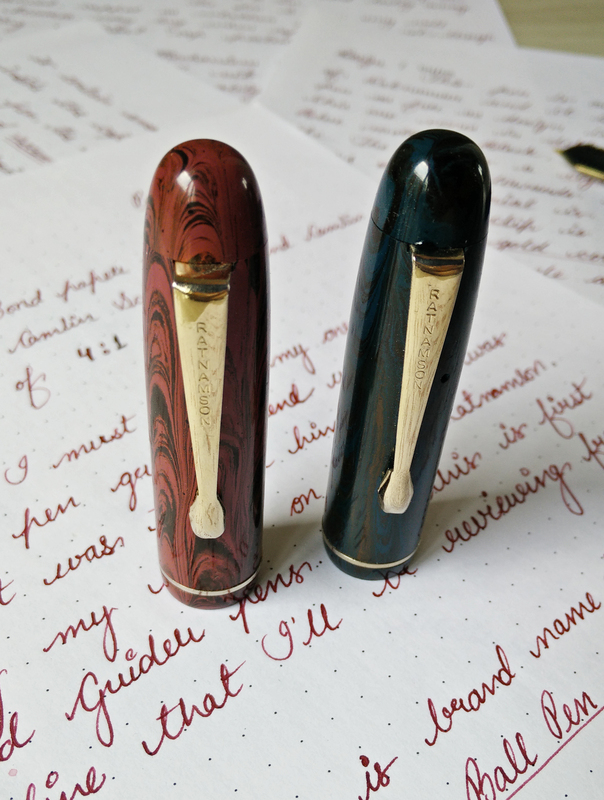 Please write a detailed article on nibs, options available in India and where to get them. Thanks for the review and the catalogue. 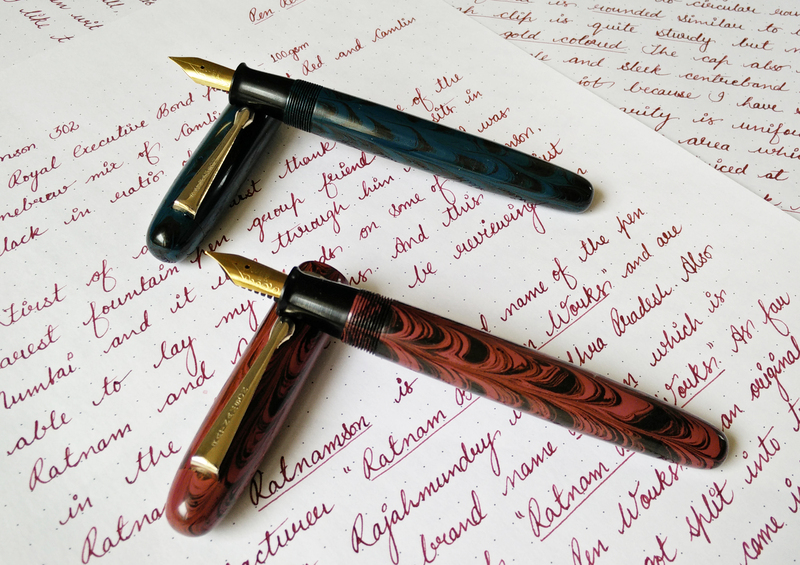 I’d like to buy a Ratnam, Guider and a Brahman pen (read about these guys online) apart from a Ratnamson pen. Any idea how I can reach the others? Very nice review Mr. Mehandiratta. 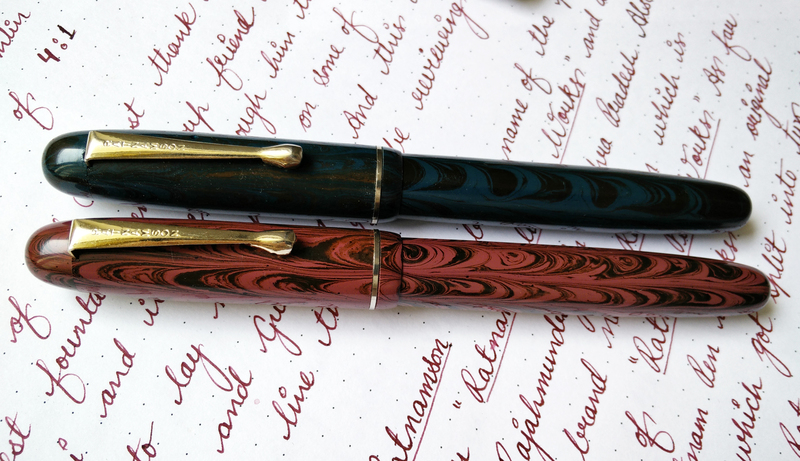 I have two Ratnamson pens- 32 and 302. the later is special as the size is not available in the market. I will buy that soon…. I Agree and share exact same experience as well. 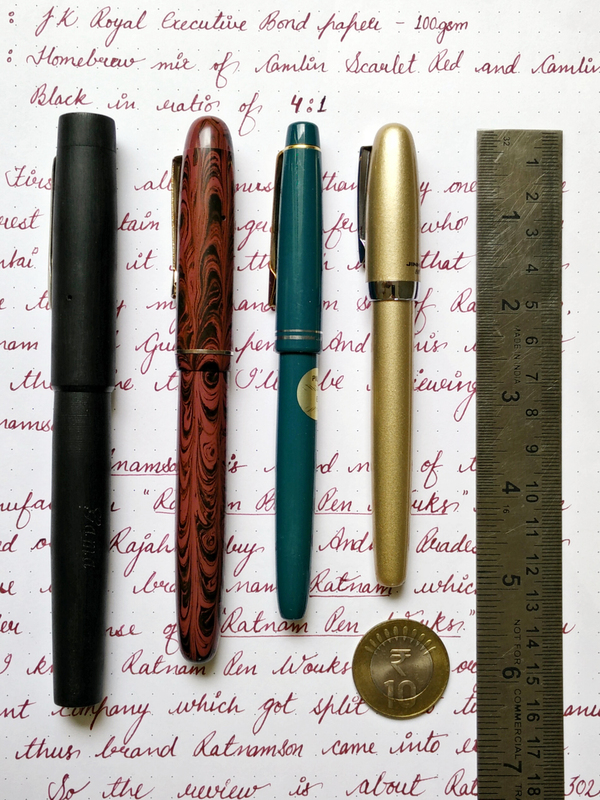 The nibs are not consistent, I own three of the Ratnamsons and my Model 32 is awesome, the 302 is going to get a new nib very soon. Great Review my Friend, you cover all questions one might have in the mind. It is crisp. The pictures are justified and clear. Wonderful Review. Thank you for going through review.. I will have to grab model 32 now soon..
Di they have a web shop?